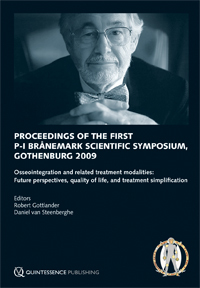 P-I Brånemark's accidental discovery of osseointegration in 1952 changed the field of dentistry forever, creating a world of possibilities for dental reconstruction. The First Brånemark Symposium honored the lifetime work of Brånemark, promoting multidisciplinary and interdisciplinary cooperation. This richly illustrated book of proceedings from the symposium features a vast array of knowledge related to osseointegration, such as mechanobiology, nanostructured surfaces, orofacial reconstructions, and orthopedic applications; it also features information regarding associated diagnostic and treatment modalities, such as full-ceramic crowns, CAD/CAM techniques, and guided surgery through the use of cone beam computed tomography, not to mention the quality-of-life considerations and treatment simplifications included. The present book of proceedings offers cutting-edge information from world-renowned experts, making it the perfect choice for the student, researcher, or clinician who wants to better understand the concept of osseointegration, its many applications, and its influence in today's world.